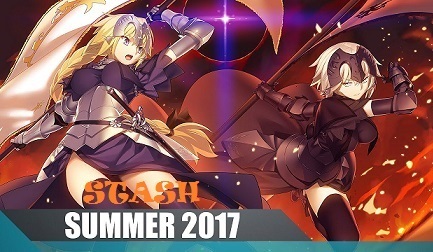 Anime Stash Community Forum | Introduction and Support | News & Updates | Topic: Summer 2017 Kicks In! The new batch of animes from the 2017 Summer lineup now kicks in with swords, witches and cute gals. We welcome any suggestion of animes you like us to upload, in case we will be missing some. And we're hoping old krews to comeback for more fun. Re: Summer 2017 Kicks In! is it connected to the other touken ranbu? Please don't worry, mate. I'm gonna do Fate and Owari, so it's gonna be late as usual as I await for good sources. XDD No hurries for those 2. I actually like binging series like those for most satisfaction. UTW resurrects! Fate already got one freaking A+ source. Just go to see the first Heaven's Feel trailer and it's amazingly great! I can feel the hype for the last part of the original Fate series. How is doing a magical girls spinoff not ruining the series ? already got the first ep of Senki Zesshou Symphogear AXZ from commie. The first Saber path of Fate was so so ... IMHO. UBW is a lot more interesting with the path, because Shiro is a lot more interesting as a main character with conflict with his current/past and future self. I have not finished heavens feel path in game, because I wasn't interested with main girl character from it (Sakura ?). So I probably will watch the anime, and at least I will not know what will happen.